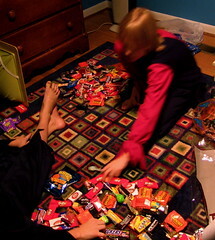 Trading candy after an evening of trick-or-treating is always the best part. Took our godson out, as is the tradition. This year, he was an evil jester and we hit two neighborhoods for the haul.